You know how sometimes you try to smash out your work, write that research paper, answer all those emails…and then you end up in your pajamas at 6pm eating Dominos and watching The Bachelor? Yeah, that’s kinda how this blog post is gonna go. 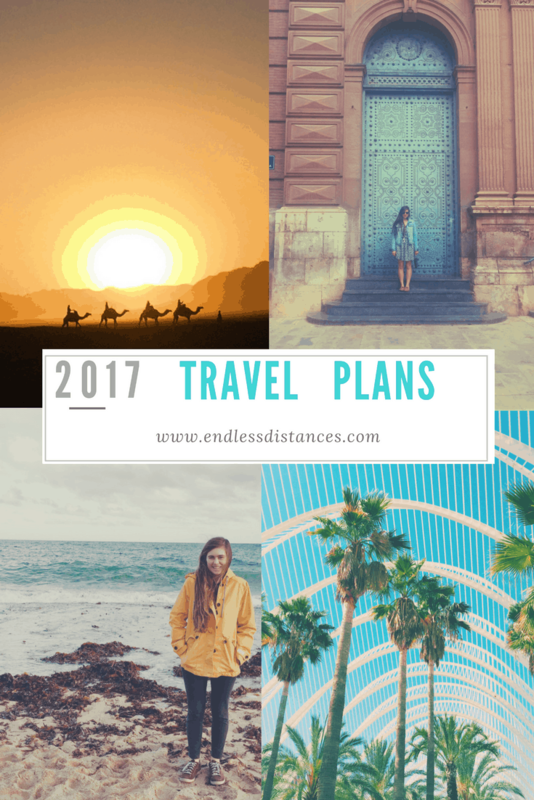 I wasn’t planning on doing one of those “2017 Travel Plans!” posts, mainly because things never go to plan. Last year I ended up in Norway because of three girls I didn’t even know at the beginning of the year! Same thing with Morocco, I had 0 inkling I would fall in love with that country in 2016. So bearing that in mind, here are my 2017 travel plans….the concrete and the less than concrete. PRAGUE: I’ve already booked a quick weekend in Prague this winter. I’m very excited to see my first bit of Eastern Europe. Send all your recommendations my way! GIRONA/MENORCA: I’m heading to the city of Girona in Spain in the Spring to see some Spanish friends I met in England last year. If it’s nice weather we will hopefully make it over to the island of Menorca as well! It will be so nice to see their home that I’ve heard so much about! Mosaics for days….. Today’s #fridayescapes is to the magnificent mosaic heaven of Park Güell. Sigh. Barcelona, Spain. 2016. BARCELONA: From Girona we’re heading down to Barcelona for a few days and hopefully renting a big Airbnb. I haven’t been back to Barcelona since I was 8 years old but I’m still in love with this city. DUNKIRK: I’m really hoping to acquire some funding and head over to one of the refugee camps in France. Working with asylum seekers in 2016 was one of the most meaningful things I have ever done and I would really like to continue with this work in any way I can. BUDAPEST: I’ve been wanting to visit this city since I first lived in England three years ago and saw a friend’s study abroad photo of the Szechenyi baths. My visa runs out in December so I want to take advantage of being in Europe as much as I can! ICELAND: Carrying on from Budapest…not that I’m obsessed with thermal pools or anything (spoiler: I am). I’ve been wanting to incorporate a trip to Iceland into a layover, but no good option has popped up in the last couple years! Maybe 2017’s the one! CAMINO DE SANTIAGO: The Camino is a huge trail across Northern Spain that I would love to hike sometime in my life, especially with my childhood friend Mary as she’s both my hiking buddy and she speaks Spanish (I speak…none. Why do I keep ending up in Spain??). It takes ~3 months to hike the entire trail. FRANCE: French is the only language (other than English and the most minimal Arabic) that I’m barely conversational in. I’ve been to Paris twice, didn’t fall in love with it either time, but I’ve heard the rest of France is completely different. There’s a ferry from where I’m living over to France that I would love to take advantage of. There’s also Mont St Michel, Provence, south of France…let me dream okay?? CINQUE TERRE: I would love to visit these five coastal Italian villages connected by a hiking trail, especially with my mom when she visits next Autumn. I grew up hiking and walking through forests and hills with my family – as my mom recently had knee surgery it would mean a lot to be able to do a hiking trip together once she’s recovered! HIKING ENGLAND: Still on the hiking note but a bit closer to home. Whether it’s the Southwest Coastal Path, Lake District, or Snowdonia, I just want to get outside! RHINE RIVER CRUISE: As a chunk of my family is potentially coming over to Europe in the Autumn when I (hopefully) graduate, a river cruise would be a great thing to do all together! We used to go on cruises with my grandparents a lot when I was younger, but it’s been over ten years since our last (entire!) family cruise in Alaska. Trust me, I could go on and on and on (Hawaii? Bali? India? Turkey? Antarctica? Grand Canyon? Costa Rica?). All I do in my spare time is read travel articles like Rachel Lee’s guide to choose where to stay in Bali, travel blogs, look at travel memes on social media… I think more so than anything, this post will be funny to look back on in 365 days and see if any of my plans came to fruition, and certainly which *totally unplanned* travels happen! Where are you hoping to travel to in 2017? I’m Going to Prague! Help!